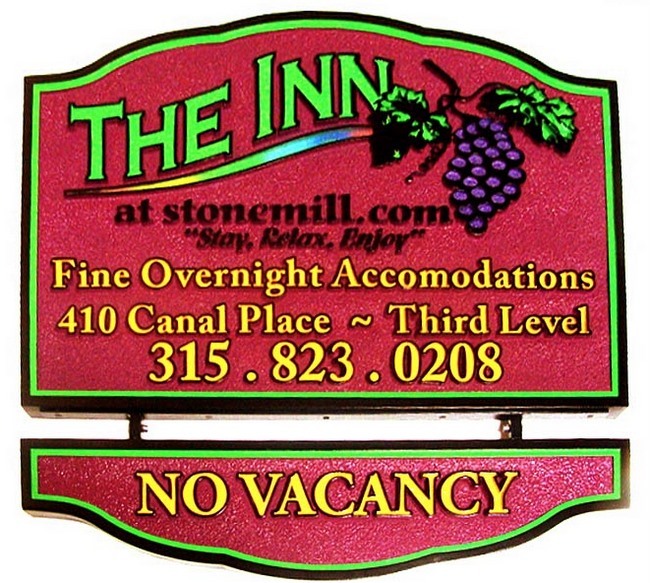 This hanging entrance sign for "The Inn at Stonemill" is made of High-Density-Urethane (HDU) carved in 2.5-D relief. The text, grape cluster, and border are raised above background. The textured background is sandblasted in a sandstone texture. The color scheme, green, and yellow is bright and cheerful. The lower rider sign is attached to the upper sign with solid rods rather than chains to prevent possible wind damage. The sign is clear-coated twice for additional protection against UV radiation and moisture.